Master Cheeser Jonathan Bing, the dog Ahab, the boy Dooly, and Man of Science Artemis Wurzle set sail from Twombly Town with a raftload of cheeses and an oboe-gun with whirl-gatherers. The rafters encounter trolls and sandbars, goblins and elves, and find themselves on the trail of a mysterious dwarf with a pocketwatch that stops time, rightfully the possession of the Man in the Moon (no bad cheeser himself). There is also an assortment of elf marvels: Twickenham's airship, the undersea device and cloak of invisibility currently in the possession of the elderly pirate Theophile Escargot, and the Lumbog Globe. "Things are abroad in the land." 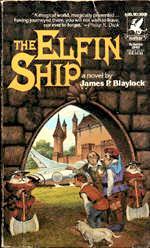 An early draft of The Elfin Ship, called The Man in the Moon, was published twenty years later, in 2002.